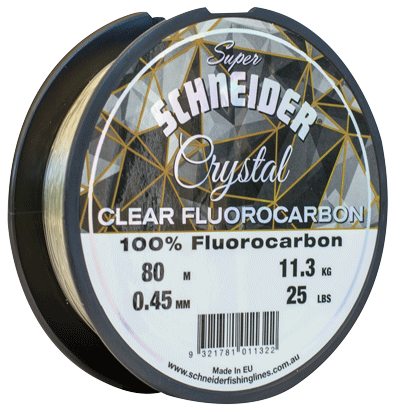 Schneider Crystal Clear 100% Fluorocarbon is a superior line made from the highest grade of PVDF Fluoro-Polymer, delivering a near zero visibility below the water. Smooth to handle incredibly sensitive to feel every bite, with ultra abrasion resistance, excellent knot strength and fast sinking. Ideal for all fishing applications performs outstandingly when placed under extreme conditions such as rough structure, rock and bottom fishing. The ideal fluorocarbon to use with Schneider’s New 8 Carrier Pink Braid.